The printed circuit boards I recently ordered through DorkbotPDX arrived! My very first professionally fabricated boards! To my eye, they look great. Nicely plated pads, solid dark purple solder mask, nicely done thin traces, and the silk screen looks really good, especially considering how small I made it. These boards implement a Lost Model Alarm for ultra micro RC planes like my 38 gram Hobbyzone Champ. 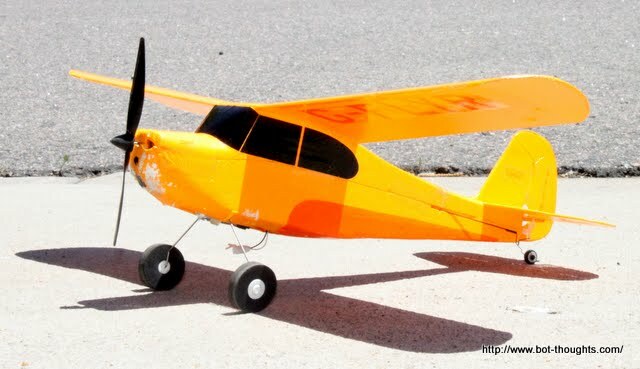 These tiny, light planes can fly outside but wind will pick them up and carry them away if you are crazy enough to fly in too much wind like I did on my maiden flight. The Lost Model Alarm beeps periodically so you can locate your lost plane. Mine landed behind a garbage can up the street and if I'd had one of these, I would've been able to track it down no problem. More on the circuit, software, and features later.